Unusually brilliant in type, coupled with an excellent limb structure, a correct base and an immaculate exterior. Top Gear was the outstanding Reserve Champion of the 2014 Oldenburg licensing. Under saddle, he shines with three first-class gaits, transmitted from a swinging back, and is literally captivating. His 30-day-test was very successful, Top Gear finished in the top group of the strong field of candidates with outstanding marks (including 10.0 for his character and 9.75 from the test rider). Meanwhile, he has won dressage competitions and qualified for the German championships. The progeny of his first crop of foals were awarded premium almost without exception. They convince with big lines, a modern type and outstanding movement capacities. The sire Totilas has revolutionized the dressage sport over the last few years. He became double European Champion in Windsor in 2009, won three Gold Medals at the World Equestrian Games in Lexington in 2010 and set several world records. On the breeding front, from his first crops of foals, he has so far sired 20 licensed sons, of which several have been awarded premium, as well as finalists at the German championships and dams of stallions. 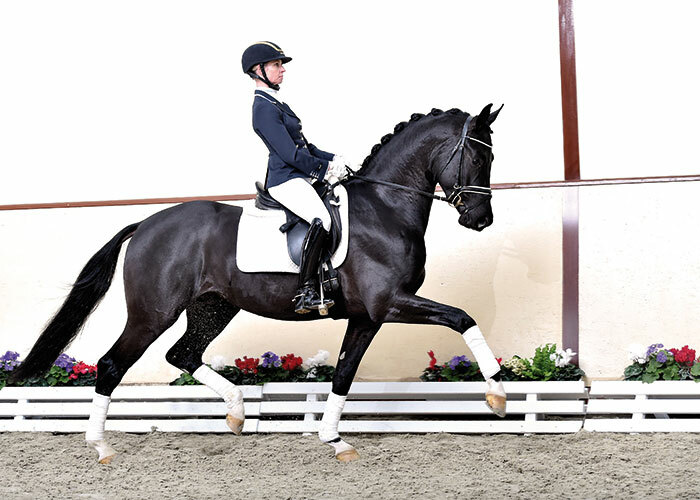 The dam Dosalla is a daughter of the Hanoverian licensing champion Don Frederico, who participated in the finals of the German national championships and has won numerous advanced level/S level dressage competitions. For this outstanding combination of breeding and sporting success, he was awarded the “Grande-Preis” in 2009 and in 2012, he was honoured as “Hanoverian Stallion of the Year”. The grand dam Saniza produced two licensed sons: Rosandro (by Rosario) and Royalist (by Royal Hit). 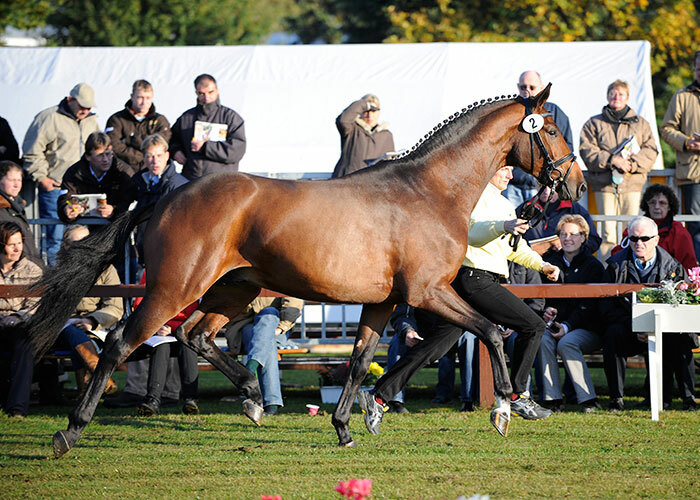 Rosandro (I c main premium, Vechta 2008) immediately established himself in breeding. He was vice German champion of five-year-old dressage horses 2009 and has won Prix St. Georges. Great-grand-sire Sandro Hit, World Champion and German champion, had made a name for himself as a dressage foundation stallion very quickly. Don Frederico and Sandro Hit have clearly marked Top Gear’s conformation. His grand-dam Enzia produced, amongst others, the dressage horse Latino (by Landor S). In the fourth generation of the pedigree comes Espri, yet another performance sire, whose sporting progeny, such as dressage team World Champion Elvis VA/Nadine Capellmann and the dual show jumping World Cup Winner E. T. FRH/Hugo Simon/AUT have won more than 2.5 million Euros. In the next generations come the known producers Lukant and Lasso. 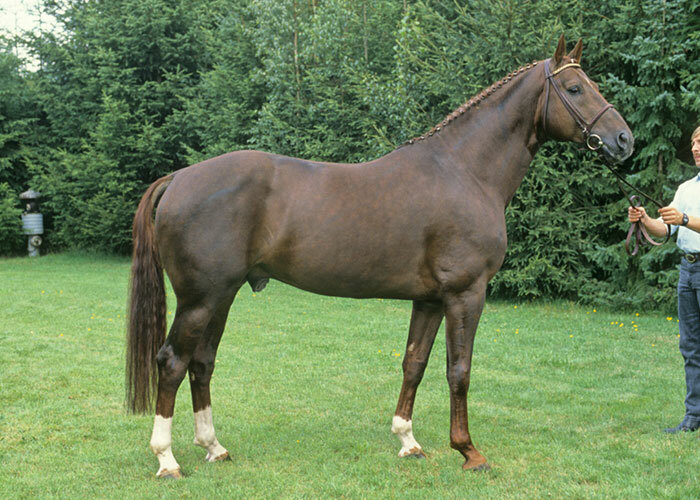 From the Hanoverian line 1000/Duldsame (by Durban-Alljeder I-Allersport etc.) comes the licensed stallion Movie Star W (by Matcho AA) as well as several successful sport horses for dressage and show jumping. Top Gear: Totilas and Donnerhall in an ideal blood combination!